Why did the Romans build aqueducts? 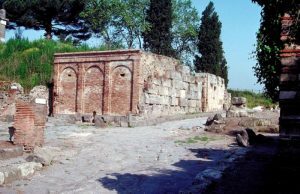 As Roman towns got bigger under the Roman Republic, it got too hard for the people who lived in the towns to get clean drinking and washing water. 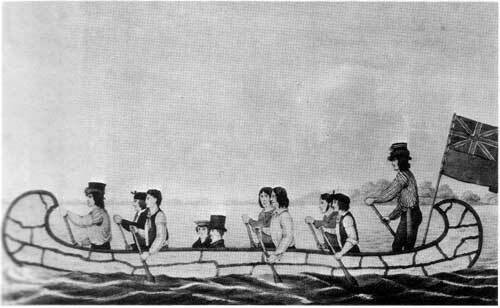 Because raw sewage was draining into the rivers, people who drank river water often got very sick or died. They got dysentery, and it gave them diarrhea. When did the Romans build the first aqueduct? Local governments, first in the city of Rome and then in other cities in the growing Empire, decided to build long stone channels to carry clean water from nearby hills to the towns. They built the first Roman aqueduct in 312 BC. People in other empires – in the Persian Empire – had been building aqueducts earlier. 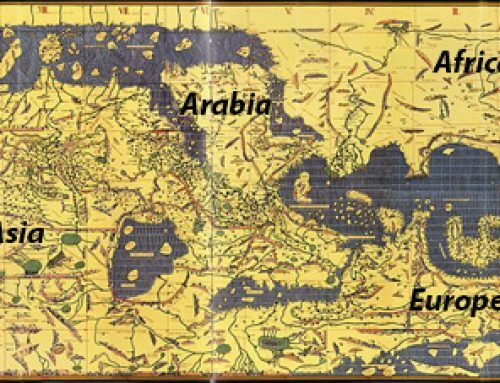 Persian ones had mostly run underground, and the Roman aqueducts ran partly above ground (and partly underground). Why do we call them aqueducts? Aqueducts (ACK-wa-ducts) got their name from the Latin word for water, aqua, and the Latin word for channel, ductus. By the time of the Empire, three hundred years later, most Roman towns had at least one aqueduct to bring in fresh water, and big cities like Rome had ten aqueducts or more. These aqueducts were quite a challenge to build. 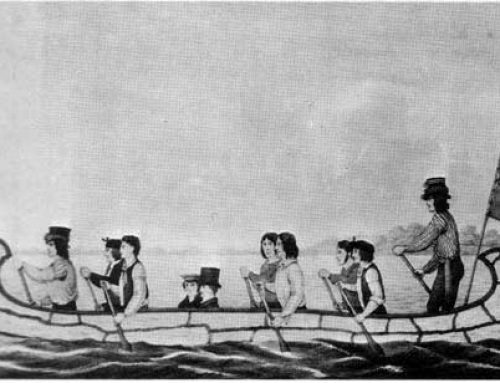 The engineering had to be just right in order to get the water to run through the channels and get to the city without stagnating in the channel or coming too fast into the city. The engineers had to keep the slope the same all the time, so sometimes the aqueducts had to run on high arches, and other times along the ground in stone channels, or even under the ground in tunnels. The engineers had to use some pretty advanced geometry and measuring in order to make the aqueducts come out right. Some Roman aqueducts, like the Pont du Gard, go down only one centimeter for every 18,000 centimeters they travel horizontally. You have to measure very carefully to get such an exact slope. Roman engineers built aqueducts all over the Roman Empire, from Syria to England. All Roman towns pretty much got clean drinking water from these aqueducts. What if the water ran short? The castellum divisorium at Pompeii – an automatic way of using gravity to make sure water went where it was needed. If there was a drought and there was not enough water in the aqueduct for everybody, the Romans had a clever device that used gravity to decide who should get the water. Roman aqueduct water flowed into a large tank. Near the bottom of the tank were holes leading to pipes. Those pipes connected to public water fountains. They could get water even if the water in the tank was very low. Half-way up the tank were holes leading to different pipes. Those pipes led to the public baths. They only got water when the tank was half full. Near the top of the tank were holes leading to a third set of pipes. Those led to rich people’s private houses, and to private businesses. They only got water when the tank was all the way full. That way, ordinary people could always be sure of getting water. The Pont du Gard is a famous Roman aqueduct. It’s in the south of France, near the city of Nimes. “Pont” means “bridge” in French, but the Pont du Gard isn’t a bridge for people – it’s a bridge for water! It brings water from the mountains over the Gardon river to Nimes. Because the land was very uneven, the bridge had to be very high. Roman engineers built the Pont du Gard out of limestone blocks in the first century AD. Not long after the Pont du Gard, about 100 AD, Roman engineers built a second huge aqueduct in eastern Spain, along the Mediterranean coast at Segovia. The Segovia aqueduct is also very high. It’s made entirely of granite blocks without mortar. The Segovia aqueduct carried water 17 kilometers (more than ten miles) from the mountains to the city of Segovia. 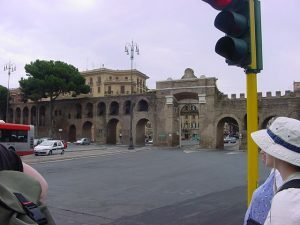 In Ostia, after the aqueducts broke down, people dug wells for water right in the middle of the street. What about in the country? Did people have aqueducts there? No – in villages, where most Roman people lived, there were no aqueducts. People who lived in the country often drank dirty water from the nearest river. Many women and children spent hours every day carrying water from the river or the nearest well in clay pots. Often these people got sick with dysentery from germs in their water, because their drinking water mixed with their sewage. Did Roman aqueducts keep people from getting sick? It’s not clear that the aqueducts really helped, because there were just as many lice and tapeworms and other parasites in places with Roman aqueducts and sewers and baths as there were in places outside the Roman empire. The aqueducts might have helped with germs though. Certainly they made sure there was always plenty of water to drink. Do Roman aqueducts still work today? 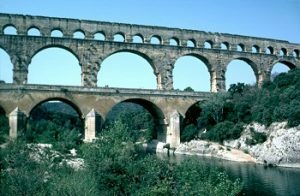 People in the Roman Empire kept on using aqueducts until the 400s AD, when the fall of the Roman Empire in Western Europe meant that most towns became much smaller, and were able to get enough water from wells. 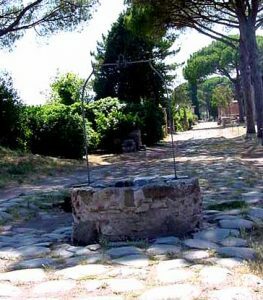 By the 400s AD in the Roman town of Ostia, the town had gotten so much smaller that the people living there didn’t need to keep this street clear anymore, and they put their well right in the middle of the street! Even though it’s so high, the Pont du Gard aqueduct in France was well built and lasted very well. 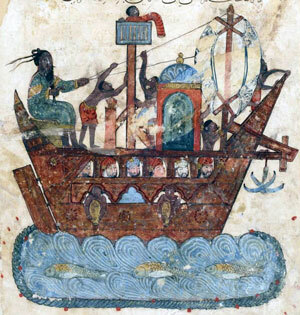 It carried water for 400 years, until the 500s AD. After the fall of Rome, people stopped cleaning it and it got clogged up. After that, people used the Pont du Gard as a bridge for people to cross the river. The Segovia aqueduct kept working much longer. 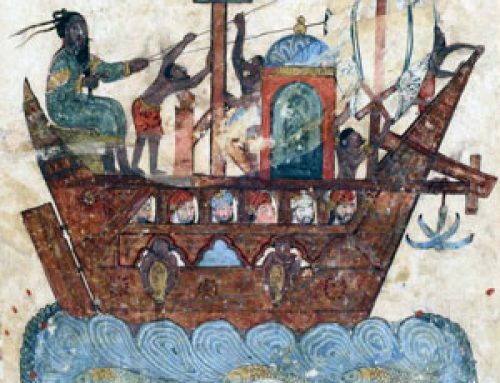 First the Visigoths, then the Islamic caliphs, then the Spanish kings and queens kept it clean and repaired. King Ferdinand and Queen Isabella had it repaired. 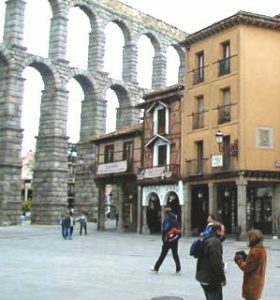 So the Segovia aqueduct still carried water into Segovia until the middle of the 1800s AD. There are parts of Roman aqueducts still being used today. 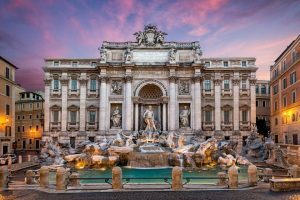 Some of the water that goes to the Trevi Fountain in Rome flows through parts of the old Aqua Virgo, a Roman aqueduct from the last century BC that ran mainly underground. Need a second source? Check out this National Geographic article! Did you find out what you wanted to know about Roman aqueducts? Still have questions? Ask them in the comments! Learn by doing: build a Lego or Minecraft aqueduct that slopes slowly down and carries water. Or try carrying a full bucket of water across your yard. Or check out the aqueducts article in the Encyclopedia Britannica. Cite this page: Carr, K.E. Roman aqueducts – Pont du Gard, Segovia, and more. Quatr.us Study Guides, August 25, 2017. Web. April 21, 2019. Thank you! I’m glad we could help. This is a good website to use. It helped me do some work in my Social Studies class. Thanks! I’m happy to hear it, Kay! Thanks for letting me know! This would’ve been a good website but it wouldn’t let me on the second page. I am trying to do a project and for half of it this website was good but that all changed. I failed thanks to you. Thank you so much!!! Sorry about the link issue, Ashley; I’ve fixed that now. I am also using this for a project and I was hoping to get some dimensions on the aqueducts, but I did not find any. So, maybe in the future, you could add some of the dimensions for others. Otherwise, it is a amazing website. The dimensions of the aqueducts would be for my physical project that I would need to have the correct slope and size otherwise it would be distorted and not be able to have the right speed of flow needed to get it right. Thanks for the suggestion, Ross! I’ll try to put together a project page that would have the information you’d need to do the project. But the slope and width varied with each aqueduct that was built, depending on how far it had to go, what the water pressure was at the source, and the topography in between. Oh, I’m so happy to hear it, Hannah! Best of luck with your project. Feel free to ask if you have any questions.